Even if new technology is able to send salmon shooting over Grand Coulee, the habitat beyond may not be hospitable. Once upon a time, salmon swam in the Spokane River. The chinook at the base of Spokane Falls could grow to 80 pounds. The river was so thick with salmon, author Sherman Alexie's grandma told him, that you could walk across their backs. Then, in a blitz of industry and engineering, the salmon were destroyed. First came the lumber mills that spat wood chips and industrial waste into the river, slowly choking it and sending salmon belly-up. In 1915, the river was dammed, creating Long Lake and blocking salmon migration to the upper portions of the Spokane's watershed. And by 1942, the final wall had dropped: the Grand Coulee Dam took 12 million cubic yards of concrete and jutted 550 feet into the air, without a single fish ladder. But Spokane Riverkeeper Jerry White still hasn't let go of this remnant of the Spokane's past. "I doggedly hang on to the idea we're still a salmon river," White says. "Underneath, if you scratched the paint of Spokane ... that salmon consciousness, so to speak, is still here." And it's possible that some day, he says, the salmon themselves could be here again. "Looking and taking the long view toward salmon recovery in Spokane?" White says. "That's no longer a laughable idea." The idea, however far off, might not just be feasible — it may be the key to saving wild salmon in the Northwest entirely. 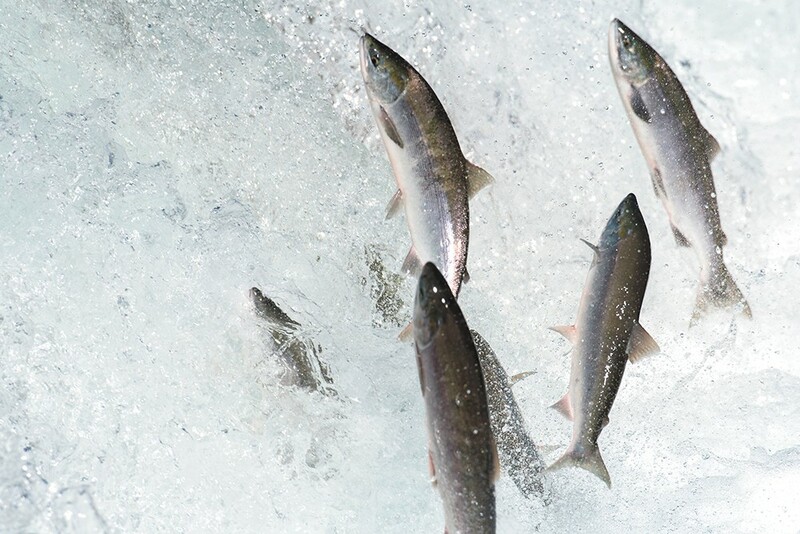 Here's the bad news: 2015 was a nightmare year for salmon and other fish in the Northwest. There was the heat. Crank up the water temperature hot enough, and salmon die. The ones that don't tend to spend more energy trying to migrate, laying smaller and weaker eggs. Because the water in the fish ladders was a few degrees warmer, the fish refused to swim up them, and the ones that did had to face even warmer temperatures in the reservoirs behind dams, which tend to be hotter and more dangerous to fish. The problem wasn't just in the rivers. The "blob" of warm water in the Pacific Ocean reduced the food supply, meaning that fewer salmon survived, and the ones that did were scrawnier. "We lost 99 percent of the Idaho sockeye runs because of the temperature," says Sam Mace, Inland Northwest director of Save Our Wild Salmon. Then there were the fires. Massive wildfires turned forests into ash, wiping out vegetation that shaded the water and prevented soil from sloughing off into the stream. With climate change ratcheting global temperatures upward, these sorts of summers will increasingly become normal. Eventually, the only solution may be colder waters. "Getting the salmon above Grand Coulee and up into the headwaters in Canada may be the only way we keep the fish," says Tara Galuska, manager of the salmon section for the Washington State Recreation and Conservation Office. With the Grand Coulee's sheer height, a solution for salmon isn't simple. While groups like Mace's continue to push to knock down dams along the lower Snake River, making way for salmon runs in Idaho, northern Oregon, and southern Washington, knocking down the Grand Coulee and Chief Joseph dams isn't likely to ever happen. Meanwhile, a fish ladder would have to run three-quarters of a mile and travel through two small towns to get up Grand Coulee. Other options, such as hauling the fish by elevator or truck, pose their own high costs and challenges. Enter the salmon cannon. Think of the pneumatic tubes that you use to send your check whooshing over to the bank teller. Now replace the check with a fish, and the bank teller with the body of water on the other side of a dam. Developed by Whooshh Innovations, a Seattle technology company, the salmon cannon uses water pressure to send fish of all different sizes through a tube rising hundreds of feet into the air. Ideally, it would be cheaper, faster and safer for the fish than a conventional fish ladder. "It's the ultimate Slip 'N Slide, is what a lot of people say," says Tom Shearer, Whooshh's president of sales and marketing. Cody Desautel, natural resource director of the Colville Tribe, says the innovation is worth considering, though plenty of questions remain. "How far can they stay in the tube?" Desautel asks. "How steep could you go with that? How fast could you climb? Desautel says Whooshh has tested an 1,100-foot tube at a maximum angle of 40 degrees, more than enough for the climb up Grand Coulee. "We are working with independent laboratories to show that it doesn't harm or stress the fish," he says. But Desautel says the problem isn't just a matter of getting the fish over the Grand Coulee and Chief Joseph dams. Lake Roosevelt is a far cry from the free-flowing river it once was. This year, the question of whether salmon could survive in that habitat is being studied. Beyond dams and climate change, those rooting for salmon recovery have to contend with population growth. Over the years, White notes, riverside development has chipped away at the habitat for fish, cutting down the cottonwood trees, willows and other plants that shade the river, keeping it cool and preventing erosion. Floodplains, crucial for slowing down the river, providing food and creating hiding spaces for salmon and other fish, like bull trout, have been altered to make way for neighborhoods. "We know [the] Little Spokane was a huge salmon-bearing stream," White says. "And Latah Creek was a salmon-bearing stream."